The Global status report on alcohol and health 2018 pulls together current knowledge of alcohol consumption and its risks to health on a global level, the health consequences of drinking alcohol and policy responses globally and in major world regions. 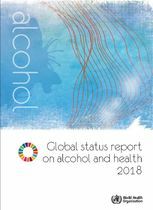 WHO Global status report on alcohol and health 2018 is represents a comprehensive of how alcohol use impacts population health, and identifies the best ways to protect and promote the health and well-being of people. Under the headline “Control alcohol, promote health, protect future generations,” WHO Director General, Dr. Tedros Adhanom Ghebreyesus, in the foreword, explain that this new report presents a comprehensive picture of how harmful alcohol use impacts population health, and identifies the best ways to protect and promote the health and well-being of people. Framework Convention on Alcohol Control? "Given the increasing encroachment of international trade and investment on the ability of national and subnational governments to control their alcohol markets, and the increasingly consolidated global alcohol producers, a strong public health case for considering the negotiation of a Framework Convention on Alcohol Control, or alternatively for including alcohol within other international control systems (Room et al., 2008), has been repeatedly presented and discussed by public health entities, experts and advocates (The Lancet, 2007; Casswell & Thamarangsi, 2009; Baumberg 2010)." Counting 450 pages it is a comprehensive report which is now published by WHO. Six thematic chapters are followed by a section of informative country profiles for all 194 WHO Member States as well as data tables supporting the information provided in chapters 2–5. The two first chapters are placing harmful use of alcohol in the context of the Sustainable Development Goals (SDGs) and in the Global Health frameworks. The report goes on to describe and analyse alcohol consumption patterns; health consequences; alcohol policy and interventions; and how reducing the harmful use of alcohol is a public health imperative. The first WHO Global status report on alcohol and health in the SDG era outlines how reducing the harmful use of alcohol is a keystone in sustainable development. It has direct impact on many of the health-related SDG targets including those for maternal and child health, infectious diseases (HIV, viral hepatitis, tuberculosis), noncommunicable diseases and mental health, injuries and poisonings. Alcohol is directly covered in SDG target 3.5 – “Strengthen the prevention and treatment of substance abuse, including narcotic drug abuse and harmful use of alcohol”. WHO figures show that worldwide in 2016, more than half (57%) of the global population aged 15 years and over had abstained from drinking alcohol in the previous 12 months. The regions of the world where the majority of the population are current drinkers are the Americas, Europe and Western Pacific. Total alcohol per capita consumption in the world’s population over 15 years of age rose from 5.5 litres of pure alcohol in 2005 to 6.4 litres in 2010 and was still at the level of 6.4 litres in 2016. The highest levels of per capita alcohol consumption are observed in countries of the WHO European Region. Mapping of alcohol policies show that 80 countries reported having written national alcohol policies. The presence of national alcohol policies is highest among reporting high-income countries (67%) and lowest among low-income countries (15%). The majority of countries in Africa and the Americas do not have written national alcohol policies. On the other hand almost all (95%)countries have alcohol excise taxes, but fewer than half of them use the other price strategies such as adjusting taxes to keep up with inflation and income levels, imposing minimum pricing policies, or banning below-cost selling or volume discounts. Alcohol policy development and implementation have improved globally but are still far from accomplishing effective protection of populations from alcohol-related harm. Among the challenges in reducing the harmful use of alcohol are low levels of political commitment to effective coordination of multisectoral action to reduce harmful use, the influence of powerful commercial interests which go against effective alcohol control policies, and strong drinking traditions in many cultures.